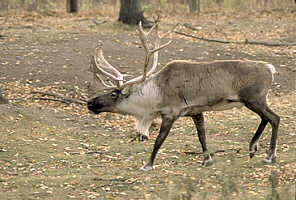 Description - Typical coloration of the Caribou is brown, shaggy fur with a whitish neck and mane. The muzzle is large and blunt with short and broad ears and a short tail. Large, crescent shaped hooves which have sharp edges ensure good footing. The antlers of adult male Caribou are massive compared to those of the female and are erect and spreading with flattened brow tines that point forward and downward over the forehead. Distribution - The Caribou inhabits the arctic tundra, alpine tundra and northern boreal forests of North America, Russia, Norway, Sweden and Finland. In the European countries, Caribou are called reindeer. They reside throughout all of British Columbia in the Coast Mountains to the Rockies and in the Columbia, Selkirk and Monashee Mountain ranges. Biology - This species is among the most migratory of all animals. They feed on lichens, mushrooms, grasses, sedges and other green plants in the summer and twigs, horsetails, and willow in the winter. Caribou are great swimmers and run at speeds of up to 50 mph. The spongy foot pads provide traction on boggy summer tundra and in the winter when the pads have shrunk, hardened and are covered with tufts of hair, the hoof rim bites into ice or crusted snow to prevent slipping.